Within the confines of my very small budget, I often consider how I can make my life more comfortable. For example, I commute by bike, and I often ask myself how I can I ride (in all weather conditions) and still feel dry, warm, and content. First, rain pants (full disclosure: I work at a Patagonia retail store). They may swish when I walk. They may look shiny in natural light. They may even contribute to slight confusion when I remove my rain pants in public. BUT they keep my jeans dry in a DC downpour. Second, bike gloves. 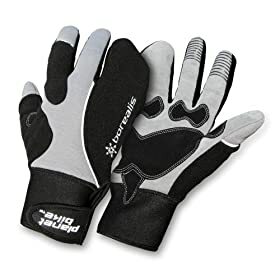 They have reflective piping for visibility and lobster claw-style fingers for warmth, not to mention they're also windproof and waterproof. Admittedly, they look a little ridiculous. But hey, I'm warm and I'm dry on a wet, winter day. No one here is complaining. The list goes on. Neck warmers, wool socks, sweat-wicking baselayers. I need them all and secretly whisper thanks when they serve me particularly well. But now, I have reached a crossroads, a tipping point if you will. I'm considering buying Dansko clogs. What are Dansko's, you ask? You've seen them. On nurses and doctors and chefs. And potentially in the near future, you might see them on me. Let me be clear -- these Dansko clogs are unrelated to biking. They'd be for my 8-hour shifts of working retail. But have I crossed the line? Have I gone too far in seeking comfort with these semi-hideous but oh-so-wonderfully-comfortable (or so I've heard) shoes? Reflecting on my past of unabashedly wearing geeky things (see Synchilla Duckbill Hat), I wonder why I hesitate at Dansko's. Why are these shoes worse than lobster gloves? Is it because there is no point of removal? Unlike a hat, I'd be stuck with them for the day. My hesitation could be due to an overly strong association of identity with shoes. After all, shoes were the only form of expression at my Catholic elementary school and high school, where I wore a uniform for 12 years straight. I want my shoes to say something about me, and that something is not necessarily "I'm beautiful... on the inside." Readers, after this deep self-reflection, it seems I just don't want to be my Dansko's, should I purchase them. If I get them and if you spot them on my feet -- where Nike Dunks or Vans Raglans usually live -- I urge you to consider that I've been standing for many hours... or was weakened by the allure of comfort on a trip to the grocery store. Like any gear geek, I suspect I'll start taking pride in wearing Dansko's after only a few wears. Please, sneaker gods. Forgive me. I am but merely human.